Abstract : Hand pose estimation has matured rapidly in recent years. The introduction of commodity depth sensors and a multitude of practical applications have spurred new advances. We provide an extensive analysis of the state-of-the-art, focusing on hand pose estimation from a single depth frame. To do so, we have implemented a considerable number of systems, and will release all software and evaluation code. 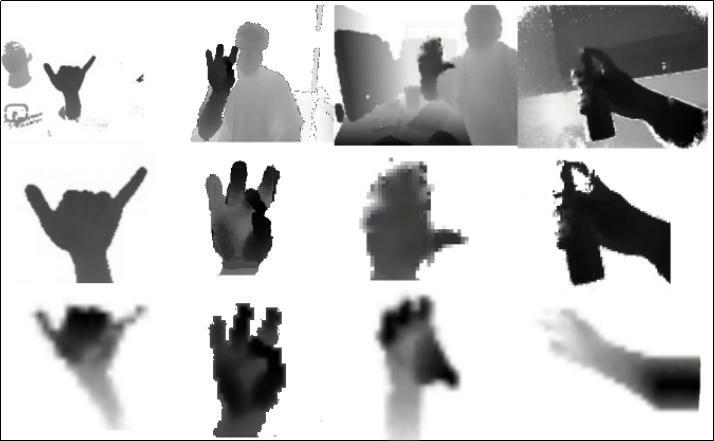 We summarize important conclusions here: (1) Pose estimation appears roughly solved for scenes with isolated hands. However, methods still struggle to analyze cluttered scenes where hands may be interacting with nearby objects and surfaces. To spur further progress we introduce a challenging new dataset with diverse, cluttered scenes. (2) Many methods evaluate themselves with disparate criteria , making comparisons difficult. We define a consistent evaluation criteria, rigorously motivated by human experiments. (3) We introduce a simple nearest-neighbor baseline that outperforms most existing systems. This implies that most systems do not generalize beyond their training sets. This also reinforces the under-appreciated point that training data is as important as the model itself. We conclude with directions for future progress.